Crochet and Knit - no difference to me.. I only have 2 arms, I can only work on one project at a time. But is there really a snobbery out there where the knitters are more of the "better" crafter? Hmmm... I'm on a Facebook group where I would say 75% of the members crochet. They shop at craft stores vs. LYS. When they shop at the LYS, they feel that the workers there look down on them and are not as friendly once they find out they crochet and don't knit. Really? 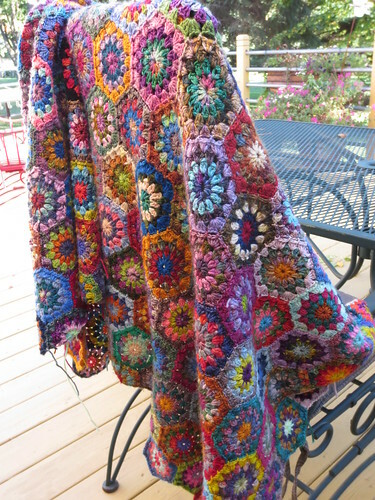 So, knitters out there.. what do you think of folks who crochet? Well, it doesn't help that they make toilet paper covers! 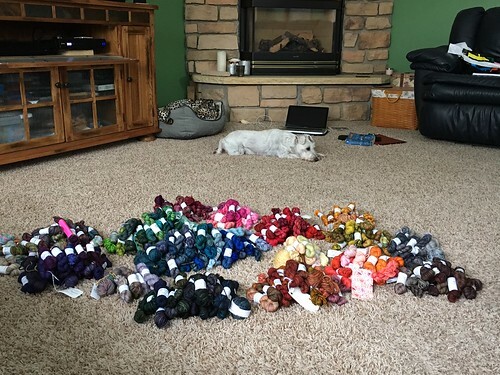 I took out all the MINI Bugga skeins I have and sorted them... yep, I think I'll have enough to make 192 squares! Although, I have a lot of dark ones.. Anyway, I packed that away... Next, while I have the mini's out... how about I finish the Hexagon blanket? Nah.. didn't feel like it. 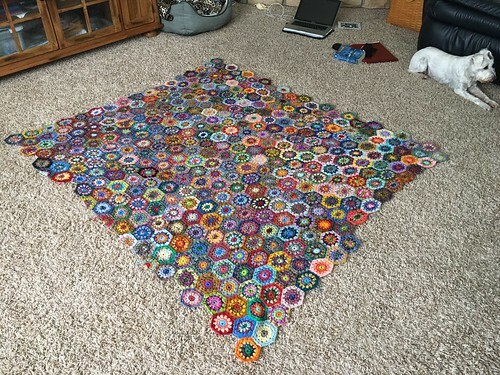 How about the blanket where my Mom made the circles and I joined them together? You see how I lined them up and just up to 3 sides for each circle and then, at the end, I'll join the 4th side? Pretty smart! 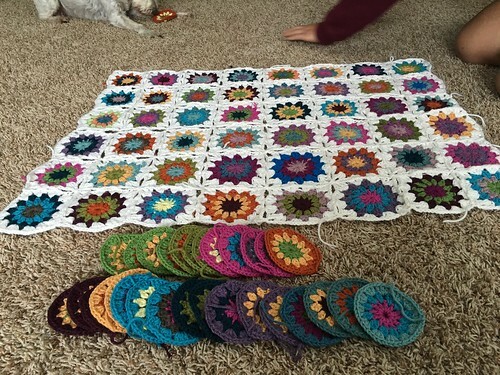 Well, I went from 48 squares to start with and ended up with 70 squares joined. And then, I packed it away. 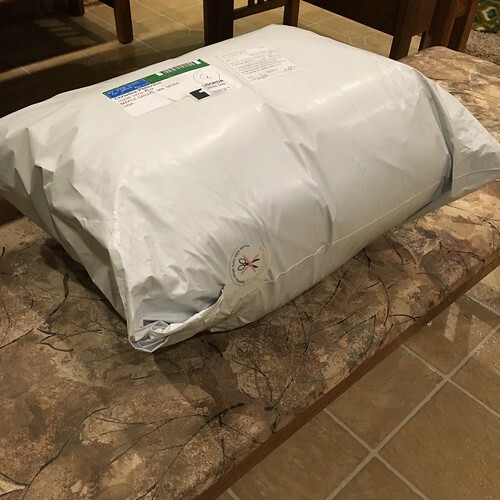 Then, the package came! It came exactly 1 week from when I ordered it from UK. 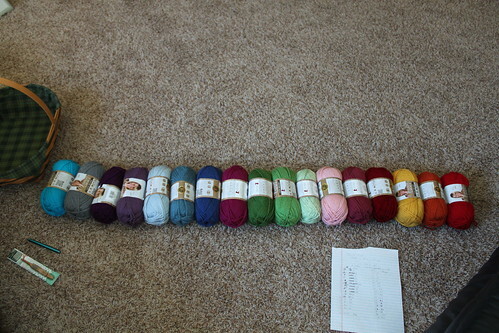 With the strong US dollar, it ended up, with shipping, $2.20 a skein of 100 gr (322 yards of DK acrylic). It is very soft and I haven't found anything here that is equivalent to it - for sure not at that price. 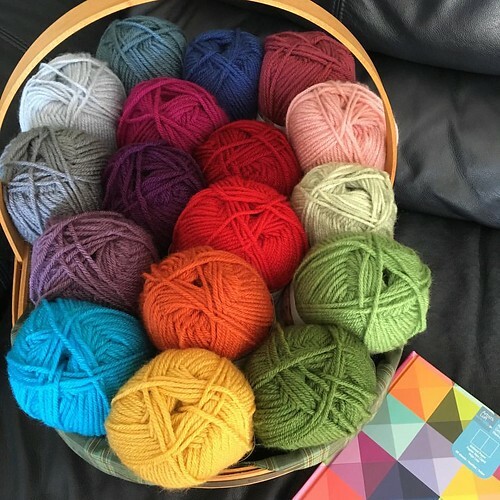 This is the yarn that Lucy from attic24 uses. She even has her own selection at Wool Warehouse. There are over 80 colors to choose from. 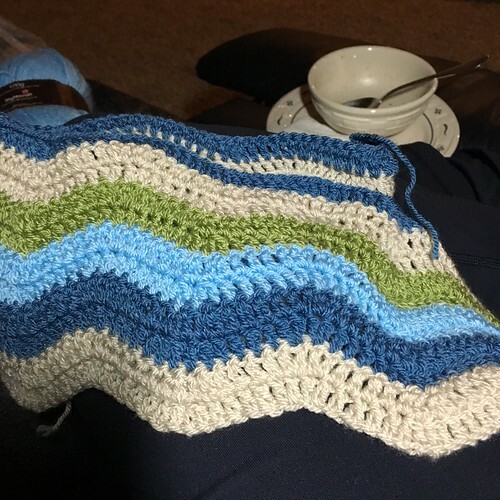 I trust Lucy's selections and ordered the Cottage kit for the Ripple Blanket. My intention was not to make the Ripple basket. 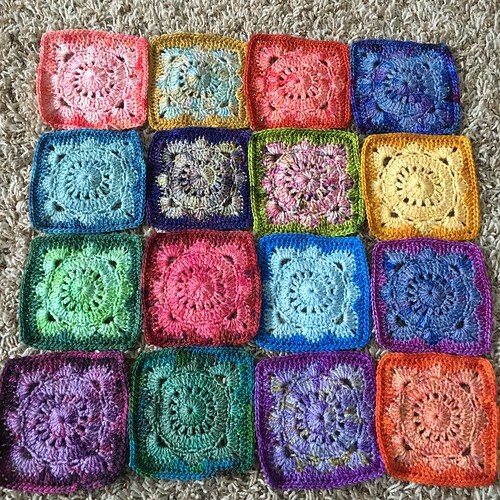 I just want to test out the yarn and make some granny squares. 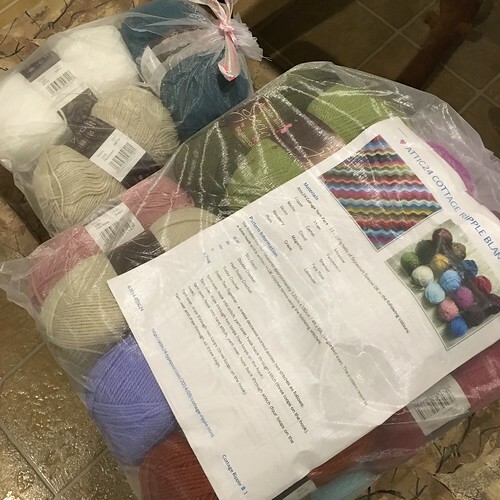 Then, as I was chatting with Jennifer via texting, she ordered 2 kits and I ordered another kit.. We are bad for each other, but luckily, this is cheap yarn! 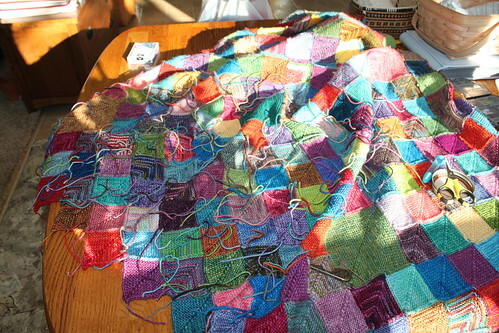 The next morning, I started the Ripple blanket. 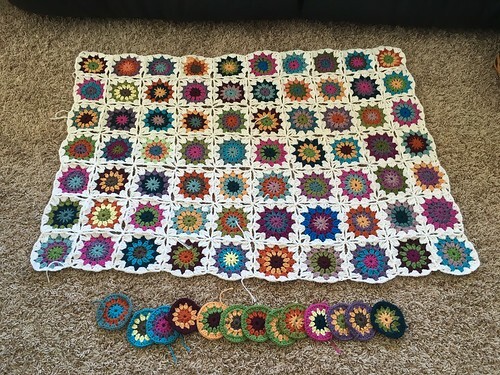 I think I need 12 repeats of the 4 colors.. Each color takes about 20 minutes to complete. So say, 90 minutes for 4 colors, I have completed 1.5.. so 10.5 repeats left and 1.5 hours each repeat...about 16 hours... Yep - faster than the knitted one. 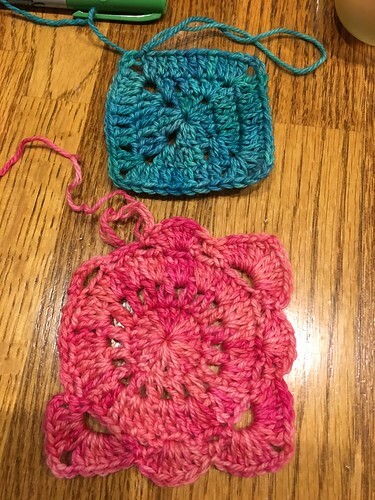 Crochet On!! 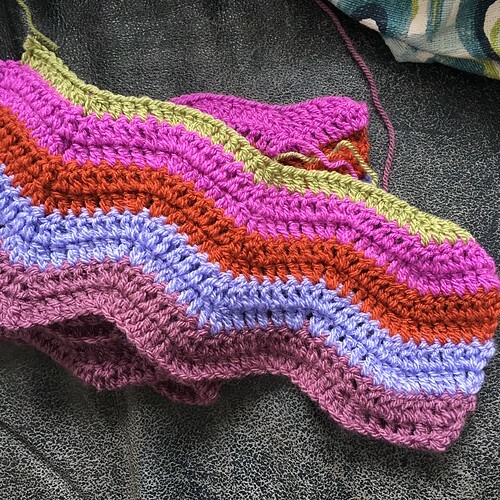 OK - am I done with my crochet stories and move on to knitting? I worked on my Monkey Socks. Must knit Monkey socks for the upcoming Year of the Monkey. 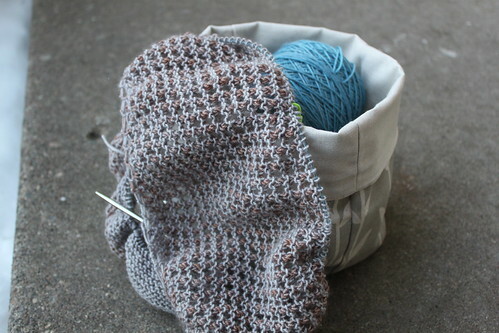 This week, I will continue to work on the shawl, socks, baby blanket, and oh yes, my Temperature Blanket. I'm now on the second row! 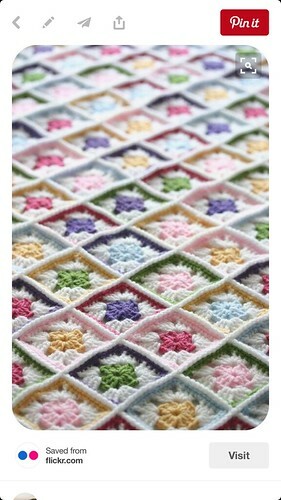 And I found another UK knitter with beautiful crochet blankets. Will be adding her blog to my list on the right. She's Heather from The Patchwork Heart. Jennifer - if you go to the October 23, 2015 post, you will find all sorts of details regarding the Willow block. Hope those of you are enjoying the snow safely out east. 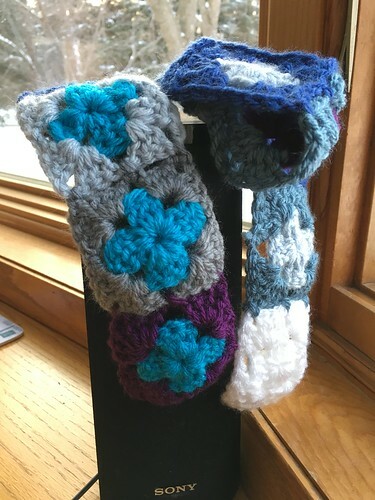 Here in Minnesota, this knitter is not getting enough snow. It's just starting to snow now - maybe we will get 2 inches if we are lucky. 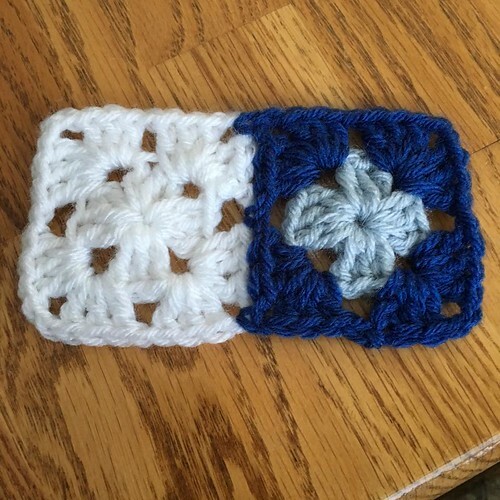 This past week, I spent more time on crocheting than knitting. Yes, I'm hooked (pun, intended). 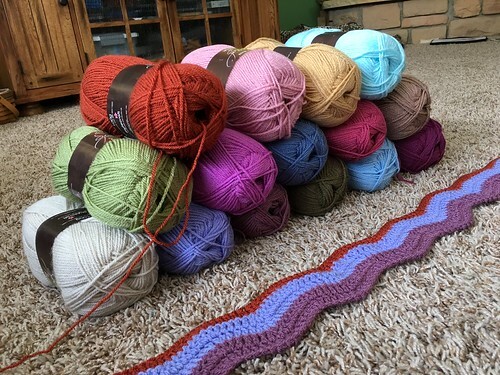 As you know, I started the Temperature blanket. Luckily for a cold spell last weekend, I managed to get the Aqua in. So, this was the chart I worked out... Sometime before we hit the upper 30's, I think I need to move the Magenta further down so I'll have to come up with a new chart. 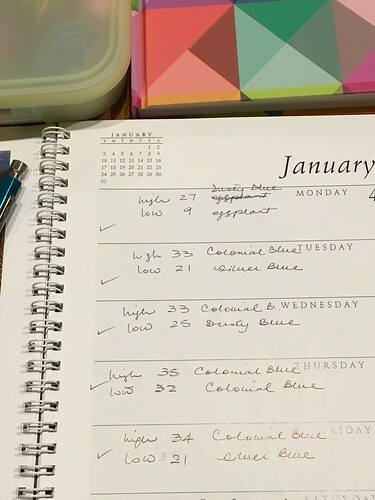 As you can see in the chart above, I had recorded the daily temperatures in a blank notebook. I was looking for a crochet pattern book at Barnes and Noble and noticed that the calendars were at 50% off. Duh! I decided to buy a Sierra Club calendar - just loved the photos in there and now, I don't have to write the dates! By next week, I will be going into the second row! 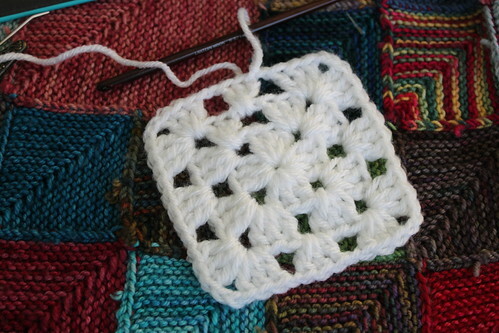 I'm getting a little bored already, but I can manage 10 minutes each day to make these squares. If not, maybe over a weekend, I should be able to catch up on a week's worth of squares. I get my temperature history for my city at wunderground.com - I record the actual high and low temp. What I am still trying to decide is when I go to Hawaii and Alaska in March and June, do I record the temperature of where I'm at? Or of my hometown? 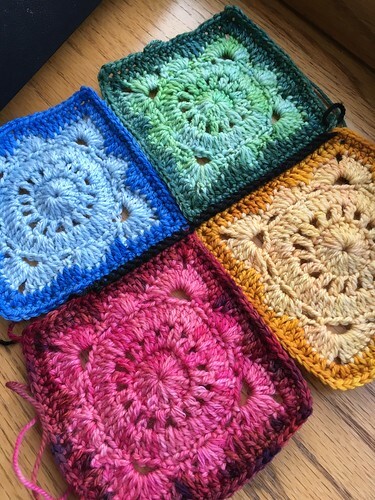 I'll decide when I get there, or I'll record both and when I get back, I'll see which looks nicer..
(I'm not mentioning the Mitered Squares because that's not crochet!). So I have enough blankets to play with, don't you think? NOT! I wanted one with solid squares. So I started with a solid granny from attic24. It was too small. It was just about 2.5" and I would have to make thousands of them! 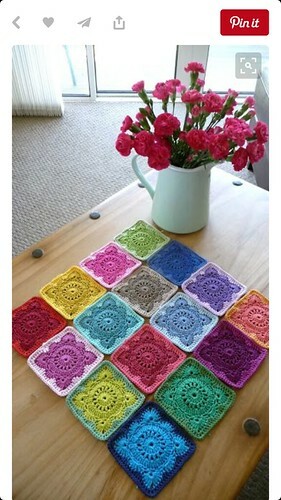 I wanted a stained-glass look so I would like to join these squares with black.. I tried a sample and I'm not sure if the black is enough.. Do I need to add a row of black to each square? (UGH!) or maybe using a thicker yarn? The Bugga is definitely softer than the Bugga used on the Hexagons - maybe it's because of the stitches. 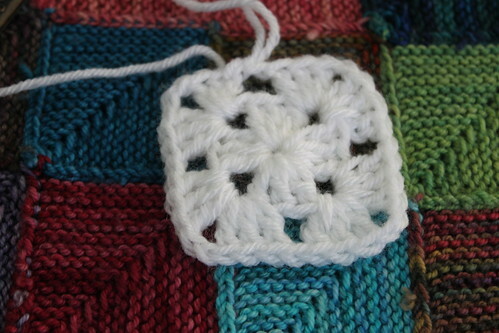 Most of the stitches on the Hexagons are double crochets and here, 1/2 of them are half double crochets. But a light weight Merino Wool-Cashmere-Nylon blanket is not a bad thing! Another idea is if I do the darker yarn on the inside square, the black would show up better, but both Jennifer and my non-crafter-hubby likes the lighter color on the inside... 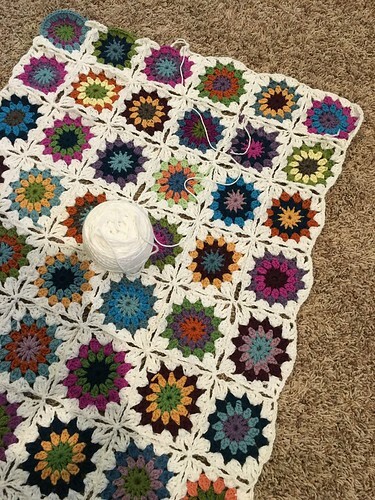 I also don't like to only be able to join AFTER I have all the squares for the blanket. 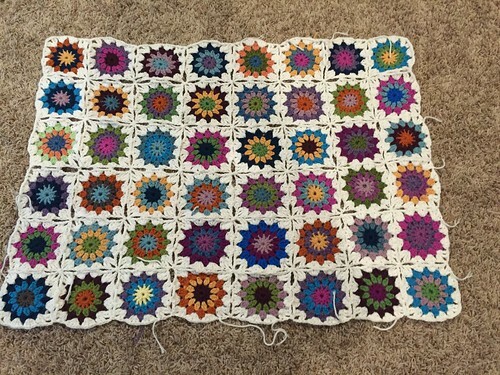 I could wait until I have 2 rows of "all the squares" for the row to start joining. Also - the British ladies all seem to use this Stylecraft DK yarn for their crochet. I think it's 100% Acrylic and I don't know there are equivalents to them here at Joann's or Michael's.. they certainly don't have their colors! 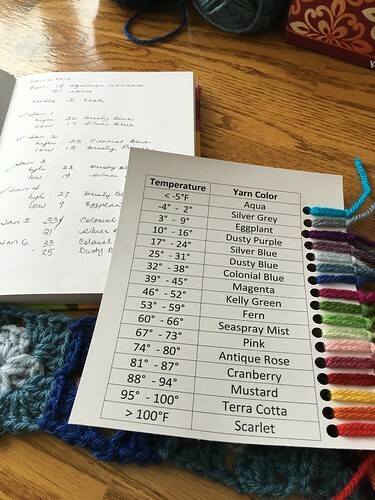 The Vanna's Choice is actually Aran weight, not worsted that I thought. 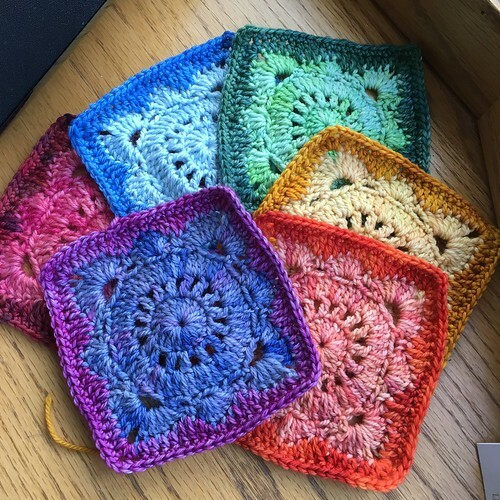 Lucy at attic24 has a site to be able to order some colors she's put together. With shipping to the US, it comes up to about $40 for 15 skeins - still reasonable at less than $3 per skein, 100 gr. 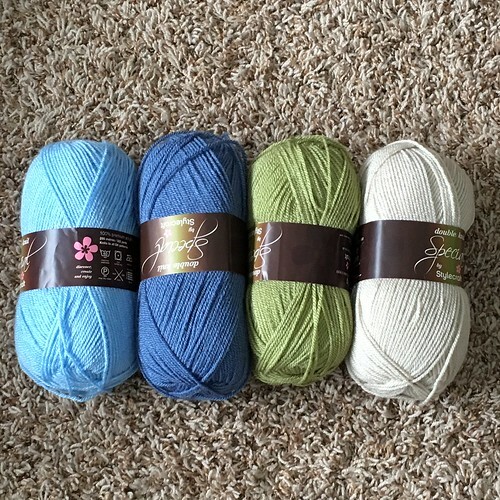 I did find a US supplies at $3.09 a skein before shipping. Maybe that's the way to go.. And oh, I also am very attracted to the Sunburst pattern: (maybe I need the Stylecraft yarn for this - pick a few shades and just randomly make the same thing with different shades? I'm hooked, I tell ya. Frankie, Alicia, and Susan are still reading my blog. I think Jennifer may also be reading this... I did a drawing and Alicia is the winner! I will contact you for your mailing address!! Thank you for not giving up on me! 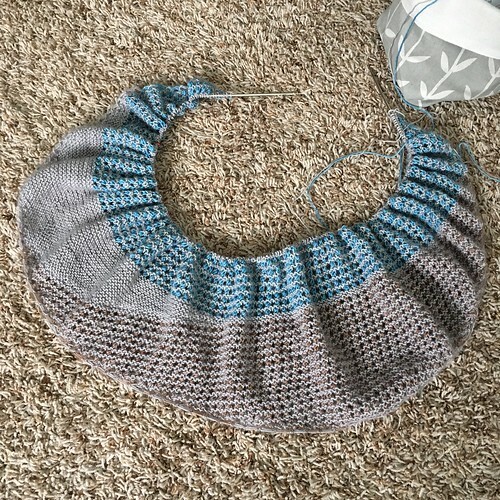 So in the last few days, I decided to start a shawl. With some many kits and options, I decided on Skipping Dots. I bought Baah! yarn when the proprietor, Mira Cole, was at my LYS doing a trunk show. I wished I took a photo of the finished shawl, but I didn't. Anyway, I'm almost done with the second section. 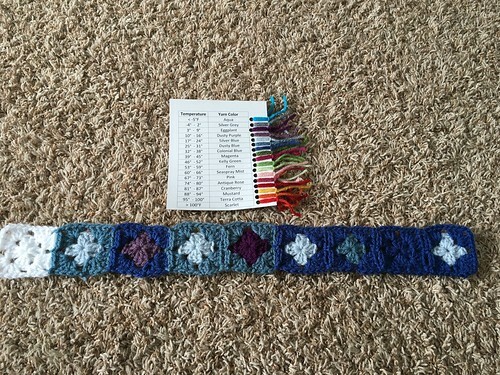 I'm doing an extra 2 repeats for each section. This is more neutral than my usual selection, but as long as there is blue in it, I'm good to go. The two on the left are Manhattan - 400 yards, MCN. The blue is Platinum, 330 yards with some silver bits in it. 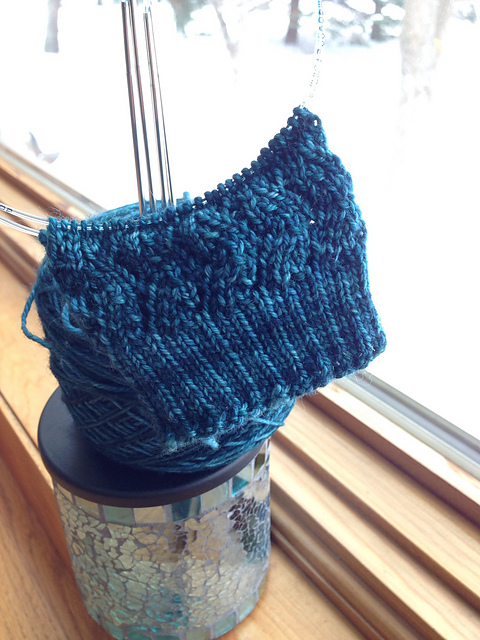 The Hazel Knits group in Ravelry is starting the January/February KAL. Being this year is going to be the Year of the Monkey (yep, my husband will be 60, my son will be 24 (not until 2017 as he is a young Monkey born near the end of the Lunar calendar) - I have 2 Monkeys in the house! 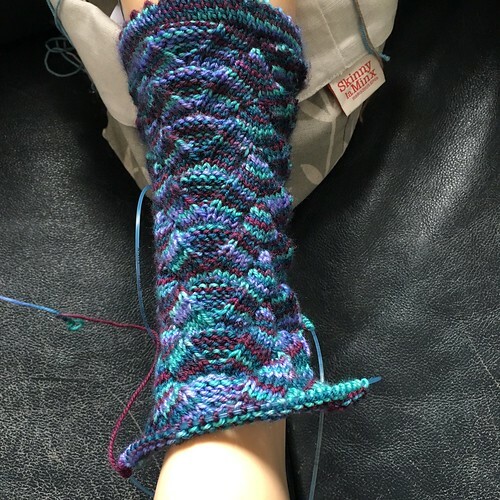 ), we can knit Monkey socks in HK yarn. And you know that can get me back to knitting socks, right? I'm going to use one of my coveted Multi colored HK yarns in Grape Harvest. 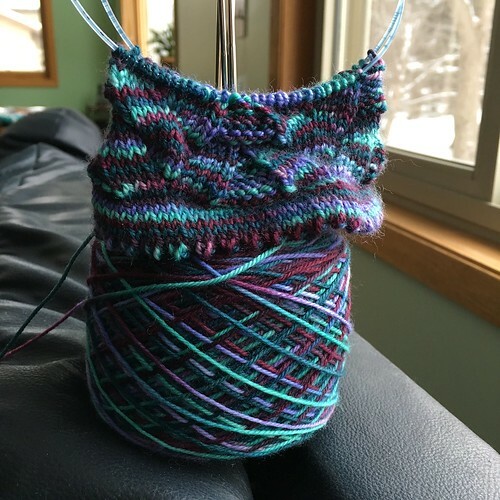 Since Cookie A is on sabbatical, we can knit any of Cookie's February socks released in the last few years. I'll pick up my Bjork Socks I started a year ago.. 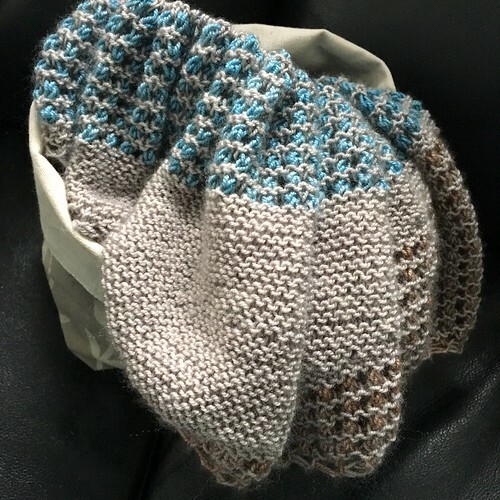 I think I used Hazel Knits Entice on this one. You like my journal of the many colors??? This is cheap Acrylic. That way, if I give up, I don't feel so bad. The yarn usually $3.99 a skein. It was on sale for $2.29 plus an additional 20% off due to my overall purchase. So it costs about the same price as a skein of Bugga. HAHA! 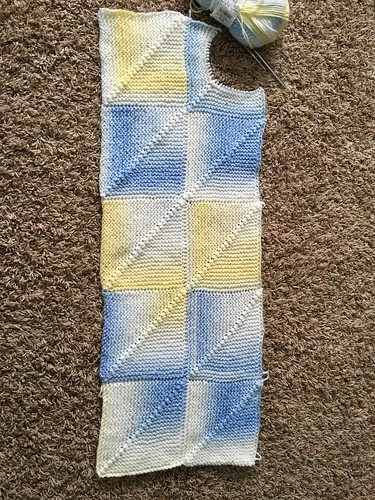 I swatched out a square. And this was 4". 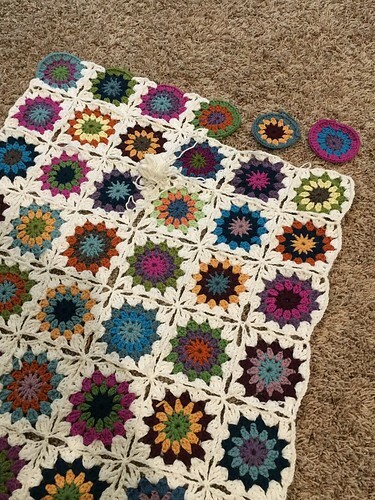 I really wanted to border everything in white, but 4" will make the blanket too big. 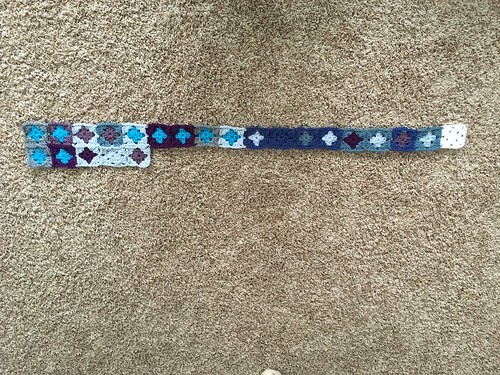 so I opt for one size up for the hook and stay at 2 rows, which was at 3". There are 366 days next year, plus 12 white squares to mark the beginning of the month so I will have 378 squares - exactly 18 per row times 21 rows. I approximated my temperature range and came up with these 2 colors (low of 17, high of 30) for yesterday. The Aqua didn't really fit in so I'm going to use it when it's -5 degrees Fahrenheit. I don't like the bright red at the end.. I'm assigning it to > 100 degrees. 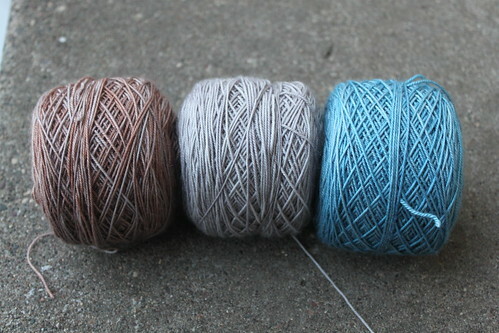 These 2 colors were what I had from before - I was going to make a baby afghan with those colors. So, Jennifer - won't you join me since you want to get into crocheting?